These supplies are most cost effective if you order them with plants where they can fit in space that would be used by packing material. My goal is and always has been for you to get your plants and now supplies into your hands with as little additional cost as possible. I decided to offer these pots when I saw 4" round pots at Lowes for $.69 each. My idea is that if you are ordering plants that I can slip some of these in the box over the pots that have the plants in them taking up almost no space and very little additional weight for shipping. 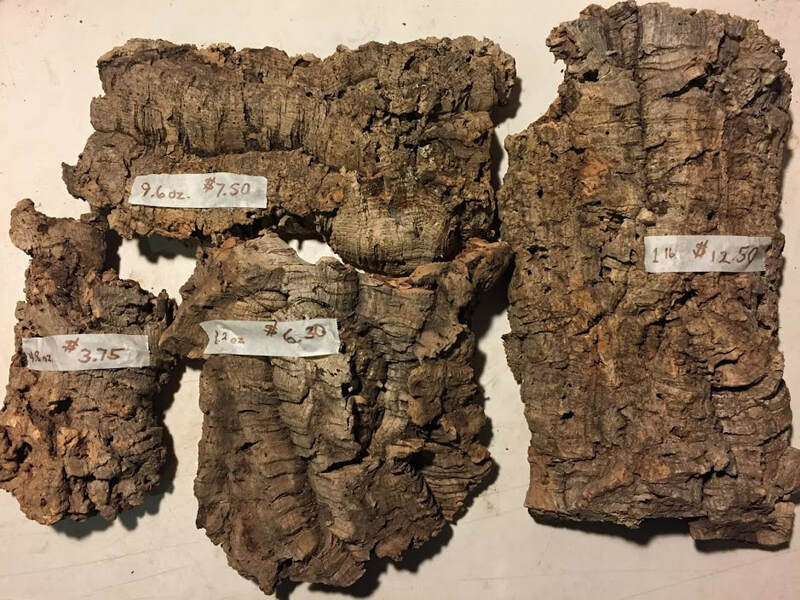 Cork bark has always been expensive and sometimes difficult to obtain. I decided to purchase some in bulk for my use and also to offer to you. It may be difficult to get a good idea of the size of these but the last one on the right is over 12" long. Pieces that large can be expensive to ship but the smaller ones might fit in the box of an existing order. The price is $12.50/pound + shipping. Also, the price depends on the actual weight of the piece as each one varies.